I visited Seattle last week to make a presentation about public transport in Zurich, Vienna and online (at GreenCityStreets.com) at the city of Seattle transport department and at the University of Washington. It was great to visit Seattle, especially since the weather was clear (although cold) so I had the chance to really enjoy walking around the city, especially the Pike Place Public Market and the downtown. I stayed at the Inn at the Market, a splurge, but worth it simply because you can walk a half-block to the Public Market. On Tuesday I made my presentation at the Seattle Planning Department (Improving public transport efficiency: Zurich, Vienna and Online), I rode the monorail and took the ferry to Bainbridge Island … a full day. No trip to Seattle would be complete without a trip on the Seattle Monorail! It was built as part of the 1962 Seattle Worlds Fair so it’s celebrating its 50th birthday. The idea was to connect downtown Seattle with the World’s Fair site. The Space Needle was also built for the World’s Fair. The monorail is a short trip but lots of fun. At the end it goes through the Experience Music Project, a museum designed by architect Frank Gehry and paid for by Microsoft’s Paul Allen. There was lots of construction going on to prepare the grounds for the upcoming 50th anniversary celebration so I walked around a bit and then headed back downtown by foot. 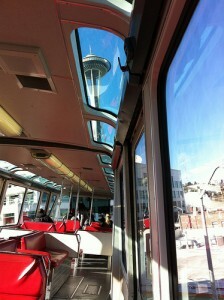 My photos of the Seattle Monorail and Space Needle on Flickr. Nice post on about monorails in Springfield (SImpsons), Sydney and Las Vegas from This Big City. There’s always something special about riding a ferry boat. Not only do they give you great views of the city but the water and light always seems different making the trip interesting. 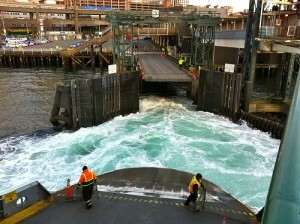 The Bainbridge Island ferry is easy, about 35-minutes and it leaves frequently throughout the day ($7.50). The last time we were in Seattle we got off the ferry and walked around Bainbridge Island a little bit, a very pleasant little town with lots of shops and restaurants. They have bike and hiking trails that look great. This time I just got off the ferry and then right back on for the trip back to Seattle. On my walk from the Seattle Center to downtown I passed a small restaurant called the Tilikum Place Cafe. It looked nice so I went in and asked to see the menu. Since an important goal for my trip was to eat as much fish as possible, I asked what the fish of the day was. The chef came over and explained the fish of the day, sturgeon on a bed of carrots and king mushrooms, and we talked a little about sturgeon. I thanked her and decided I should come back for dinner. The Tilikim Place Cafe is an extremely pleasant space, it just feels like a living room. I was not totally convinced by the chef’s description of the evening’s fish special, but since the room felt so good, I returned. My server then explained the special Appetizer: grilled baby romaine, with feta cheese, grapes and a champagne Vinaigrette. At first it didn’t appeal to me, but when she explained it again – and said it was “yummy,” I thought, why not? and ordered it along with the sturgeon. Wow, the salad was fantastic, one of the best things I have had in a long time. The ingredients just really worked, a perfect combination. I’m definitively going to try this at home. To drink I had a local pale ale. Next came the sturgeon, also, absolutely fantastic. It was served with a parsley salad – heavily seasoned with vinegar or maybe some lemon, on top. The parsley salad itself was really great. I put some aside to eat at the end of my meal – my mother always told me to eat parsley last: it eliminates bad breath … but I also thought it would be an excellent palate cleanser (the same thing?). 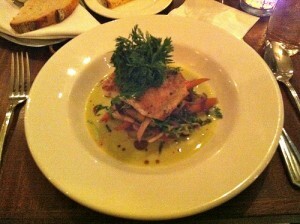 The sturgeon .. with parsley salad. The sturgeon itself and its bed of carrots and king mushrooms was very tasty. Interestingly the dish seemed to generate its own broth as I ate it .. the individual components blended together to make a really yummy soup. By this point I had almost used all my (really excellent!) sourdough bread and so had to ask for more to sop-up all the broth. The buttery mushroom flavor matched perfectly with the sourdough. I don’t usually order dessert, but because the rest of the meal had been so good, I decided to go crazy and order something. They did not have the one I wanted a combination of chocolate and Meyer lemon, so I opted for a single scoop of Meyer lemon ice cream … very very nice. Then, simply because the space was so nice, the people so friendly and the food so excellent, I asked if I could have a “half” beer to just relax into the atmosphere … absolutely no problem. So, in summary, one of the best restaurants I have eaten in, from fantastic food to wonderful service. It’s one of those restaurants where you say, I want to go back to Seattle just to eat there. 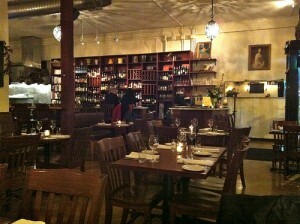 My photos of Tilikum Place Cafe on Flickr. 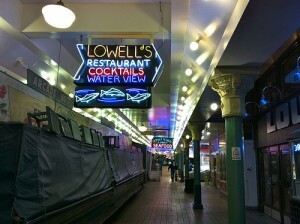 Lowell’s in Pike Place Market – neon signs. 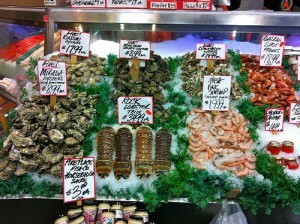 I also ate at Lowell’s in the Pike Place Market. Unfortunately I arrived too late to have dinner the first night since they closed at 5 pm, but jet lag worked in my favor so I returned for breakfast at 7 am the next day. It was excellent. House cured salmon with herbed cream cheese and a bagel, the perfect way to start the day. Oh, and did I mention the view? 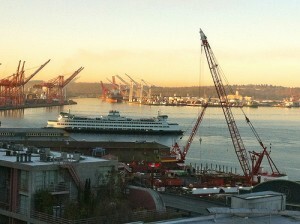 I had a nice window table looking over Elliott Bay. I stayed about an hour, just staring out the window watching the ferries with a view of the snow covered mountains in the background … just incredible. It was so great that I decided to go back for my second day’s breakfast too! Lots of my Seattle photos on Flickr were taken from the top floor dining room at Lowell’s – including the one at the top of the page. I visited Seattle several times when I lived in the Bay Area, I always enjoyed it and this visit confirmed my impression that it’s a really wonderful place. I hope to visit again soon. Here are my Seattle photos on Flickr.